Here at D4R, we’re constantly looking to expand our knowledge when it comes to the world of retail design. Trends are born and reborn each year, keeping us very much on our toes and ensuring that we continually learn from brands, peers and our own team. Before we leave 2017 behind, we thought we would look at some of our greatest learnings and retail trends throughout the year. Just a few short years ago, it was hard to miss articles which referred to physical retail being on the verge of extinction. However, as we ventured into 2017, these reports slunk away into the dark to be replaced with the more favourable headlines declaring brick-and-mortar as heavily relevant. Much to our relief. Not only were stores cropping up across the major cities as well as the lesser known towns, we saw a surge in department store concessions and temporary retail spaces throughout the globe - read more about the pop-up trend below. New brands to the market, as well as those with an enviable heritage, have ventured into the world of brick-and-mortar to bring their brand story to a whole new host of customers. Just recently, D4R assisted revered beauty brand Too Faced in opening their very first flagship store in London, with every inch of the store offering a piece of brand and brand-owner personality. This preference for a physical space is with cause, but it’s not solely reliant on sales. Instead, these permanent and temporary physical spaces have become vital for brand storytelling; allowing the retailer to connect with a whole host of customers on a personal level. Brick-and-mortar is heavily relevant – we quote our own words above. However, a store with the brand name in the fascia and racks of products inside is no longer the definition of a modern store. Instead, it is how the retailer chooses to present an experience to new and loyal customers which is of the most relevance. This began with a simple dwell space; the introduction of a small coffee bar and seating to a store. However, over the past year, we have seen this expand to an entirely different realm of experiential preference. Pop-up’s focused on the emotional response to shopping, sensory discovery playground and dinner parties with revered brands are just the beginning of this experiential retail realm. We reviewed Neom Organics' latest store in Victoria Leeds earlier this year, enjoying how the brand chose to focus on sensory experiences to take a customer from education to product. 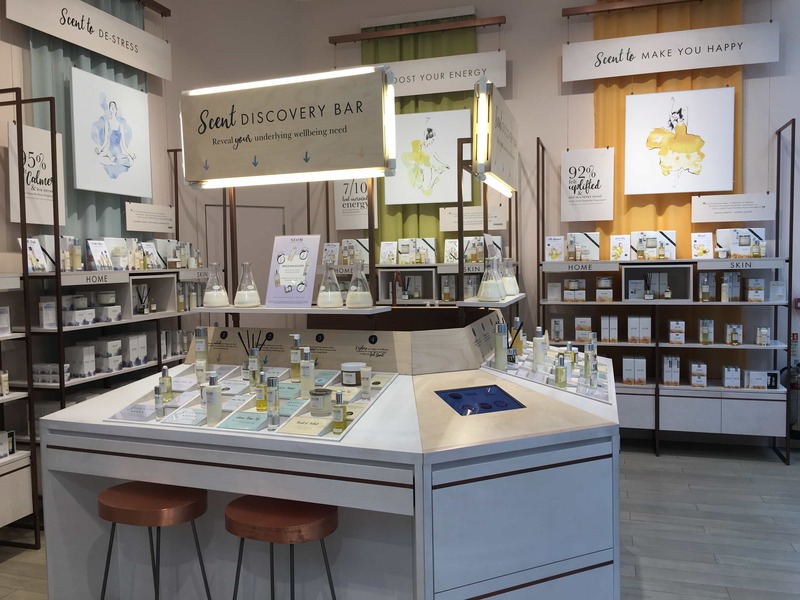 Despite it’s humble beginnings as a small dwell space – this idea of dwell time and space still being very relevant – the opportunity for expanding on the benefits of experiential and sensory retail is huge. Pop-up stores and temporary spaces have taken the retail world by storm over the past couple of years. They may have started as a way for online retailers to test the waters of the physical market, but this temporary brand space has developed into an established retail marketing tool. Brands of all shapes, sizes and heritage have chosen to open pop-ups of equally varying shapes and sizes. Available for a shorter period of time than usual stores, this not only evokes a 'fear of missing out' mentality, it also broadens the horizons of what a brand can offer. Exciting events, quirky design and playful concepts take a new level when it comes to a short-lived space. Our travelling pop-up projects with Charlotte Tilbury have enabled the luxurious brand to create stunning branded spaces which focus on customer excitement and playful brand exposure. We've written about the power of pop-ups previously, but as the enquiries for design solutions to a temporary space flood in, we're assured that pop-ups will continue to form a huge part of retail 2018. As we head into 2018, we expect a disruption to each of these retail trends – and we welcome it. We predict that 2018 will further solidify the retail space as more than a store. Forward-thinking brands and retailers will continue to repurpose their properties as experiential locations, community spaces and brand hubs. However, this next year will see implementations of this trend to the next level, including convenience brands, department stores and further pop-up spaces. And here at D4R, we can’t wait to be involved.